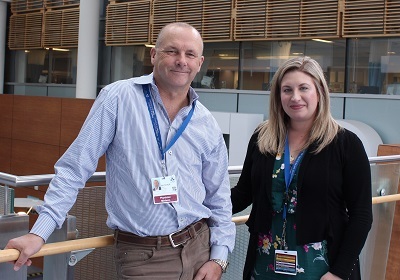 Dr. Simon Hatcher and Valerie Testa are part of a team that will launch Canada’s first research-based mental health clinic for first responders.Recognizing the mental health needs of first responders, the City of Ottawa is championing a new study led by researchers at The Ottawa Hospital and the University of Ottawa. The team will launch Canada’s first research-based mental health clinic for first responders in 2019. The project is funded under the Canadian Safety and Security Program (CSSP), a federally-funded program led by Defence Research and Development Canada (DRDC), in partnership with Public Safety Canada. First responders regularly face traumatic situations on the job and this puts them at greater risk for mental health issues and suicide. Previous research from the Canadian Institute for Public Safety Research and Treatment showed that 45 percent of first responders in Canada have symptoms consistent with at least one mental health disorder. This is thought to be about four times higher than in the general population. A related study found that 28 percent of first responders in Canada experience suicidal thoughts in their lifetime. This is thought to be double the rate in the general population. The new first responder clinic is part of a two-phase research project. The first phase will assess the preferences of Ottawa’s first responders for mental health services. The second phase will involve setting up a research-based mental health clinic and doing a pilot randomized controlled trial to test its acceptability and effectiveness over one year. The study will be open to the City of Ottawa’s police officers, firefighters, volunteer firefighters and paramedics. Along with in-kind support from the City of Ottawa, the Canadian Safety and Security Program is providing $462,000. All research at The Ottawa Hospital is also supported by the donations to The Ottawa Hospital Foundation.